This week is Tongan Language Week – Uike Kātoanga’i ‘o e Lea Faka-Tonga. Over the next five days the Pacific Cultures team will be blogging about collection items from Tonga that relate to Tongan language and culture. The week is promoted by the Aotearoa Tongan Teachers Association in partnership with the Human Rights Commission, other organisations and members of the Tongan community. The overall goals of the week can be found on the Human Rights Commission website and the Tongan Langage Week Facebook page. The first work we feature in this series is by Tongan-born artist Filipe Tohi. His large aluminium sculpture at the entrance to the Te Papa exhibition Tangata o le Moana: the story of Pacific people in New Zealand is titled Matakimoana (‘Eye of the Ocean’). 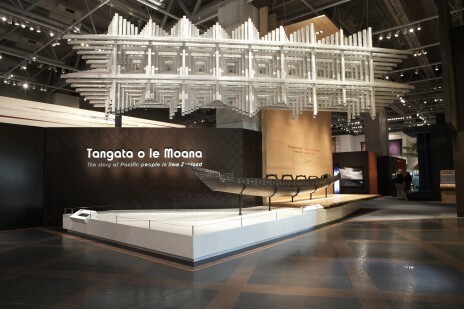 Matakimoana is a significant part of the story of Tongans and other Pacific peoples here at Te Papa. It reminds us how language, history and culture can be materialized in very sophisticated and sometimes very simple ways. Watch for more posts as we explore the Tongan Collections this week.